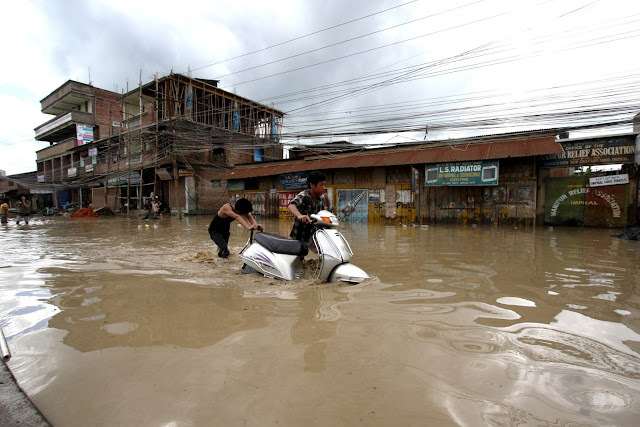 New Delhi, Aug 4 : Even as the central government rushed in the National Disaster Relief Force (NDRF), thousands of people in Manipur`s Thoubal and Chandels districts are trying to come to grips with life in relief camps after their houses were submerged by flood waters. Water-filled paddy fields have been covered by sand and community and residential ponds have been rendered unusable. "One person was killed while he was trying to protect his home at Serou village from the surging waters of the Sekmai river on Saturday evening," Robert Leisangthem, a resident of Kakching in Thoubal, told IANS on phone. This takes the toll to 21 after 20 people were killed in a landslide at Joumul village in neighbouring Chandel district on Saturday. "The water level of the Sekmai river is coming down but the impact of the floods is still being felt. Paddy fields are covered with sand and filth and community and residential ponds are filled with dirt," Leisangthem said. It is the agricultural season and the over 600-sq km area, known as the rice bowl of Manipur and inhabited by over 500,000 people, has been hit badly. According to reports, the entire Thoubal and many parts of Chandel district have been hit by the worst floods in the last 200 years. The Asian Highway No 1 connecting Imphal with Moreh on the Myanmar border has been cut off. The Chakpi river, known for its uncertain flow of water, has flooded the entire Serou region in the southern part of Thoubal district. Water is flowing near the danger mark of the the newly constructed Serou bridge. "Though the water level is coming down, people whose homes were submerged by the flood waters are living in relief camps," Leisangthem said. "The director of Manipur`s health services was seen distributing medicines. Doctors have been appointed in relief camps. Local people are distributing rice and other essentials among people affected by the floods." The Sengvai and the Chakpi rivers have also been creating havoc. "Waters are ceding. The bridge over Sengvai river, though not destroyed, has developed cracks on the side," Hechin Haokip, a resident of Pallel in Thoubal district bordering Chandel, told IANS. "Another bridge over the Chakpi river collapsed on Friday," she said. According to Haokip, as of Sunday evening, rescue teams were struggling to reach Joumul village in Chandel district as two more landslides occurred on the way to the disaster-hit area. "Since communications have been disrupted, I am not very sure if the rescue teams have been able to reach the area," Haokip said.